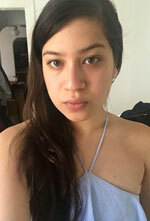 One late June day, the supermodel — who gives no fu*ks about seasonal dressing — exited her New York City apartment in a very Barbie-esque getup. The millennial pink enthusiast wore a fringe- and grommet-embellished Kreist leather jacket with matching flares, a blush cami and pearl-accented Aquazzura heels. We can easily imagine her Mattel counterpart lusting over the outfit. Then, just last week, Vogue‘s August cover co-star stepped out in a throwback Star Wars tee and cherry-red bell-bottoms by charity-minded label SemSem (which is currently hosting a trunkshow on Moda Operandi, BTW). She updated the 70s-inspired look with suede Stuart Weitzman mules of the same shade, outsize D-frame shades and a compact Tyler Ellis top-handle bag. You’ll notice that, in both cases, Gigi kept the look feeling, you know, modern by swapping traditional denim for a fun, alt pant material. 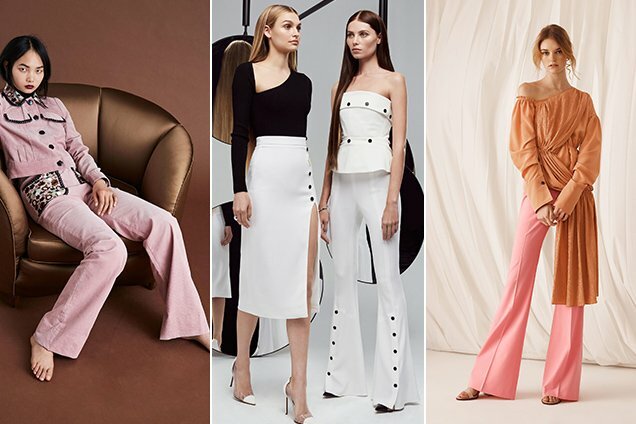 The Resort 2018 runways, which featured as many, if not more, bell-bottoms as Gigi’s closet, followed a similar styling precept. 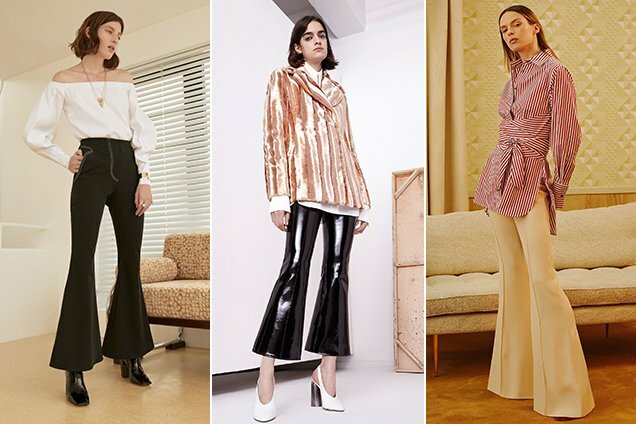 Toronto-based label Beaufille, known for its statement tailoring and artisanal touches, showed flared trousers with cute contrast stitching at the fly and pockets. Designers Chloé and Parris Gordon paired the bell-bottoms with a balloon-sleeve off-the-shoulder top and square-toed, block-heeled booties. For Resort 2018, Ellery’s signature bell-bottoms came in black leather, patent black and caramel, lime green and icy blue. Kym Ellery complemented the statement bottoms with crisp button-downs, some cropped and ruffled, some topped with dramatic eye-catching jackets. One particular look — cropped black leather flares styled with a yellow turtleneck worn under a tucked-in black leather button-down — was incredibly Raf Simons-reminiscent (in a good way). At Khaite, we saw more statement-making yet neutral bottoms topped with not your average work shirts. Orla Kiely showed a modern Canadian tux: soft pink micro-corduroy bell-bottoms worn with a matching trucker jacket. Cushnie et Ochs, who create going-out lewks for power women, showed hardware-embellished flares with matching peplum tube tops and slinky black bell-bottoms with glittery camis. At ADEAM, Hanako Maeda topped sleek bell-bottom trousers with flowy, romantic blouses. The general rule? Flares are made to stand out. You may as well go all in and match the dramatic bottoms with equally OTT tops. Be aware of your waist, however — opt for ones with waist-cinching details (ruching, peplum), tuck when possible and please, none longer than crotch-length (unless they’ve got asymmetric hems). Also, maximize your flares’ leg-lengthening potential with heels. Mules or block-heeled booties appear to be designers’ current preference, although the heel-averse will look just as cool in carefree Converse or pointed flats. Basically, make sure whatever’s sticking out from beneath your bells has an interesting toe. Oh, and this goes without saying, but avoid puddles AT ALL COSTS.